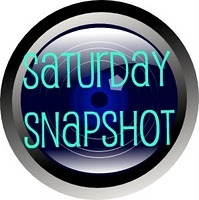 I can’t believe that I did not post for Saturday Snapshot last week. I believe that is a crime in this state! Ok, I’m joking but I did feel like something was missing. I love Saturday Snapshot hostessed by the lovely Melinda at West Metro Mommy Reads. I will try to not let this happen again! I know that I am not the only one suffering from the cold. It’s been terrible here in New Jersey, but I know things can be worse. I’ve seen the photos of what the poor folks in Chicago and the rest of the mid-west are experiencing. It’s scary. I had to be up and out pretty early the first few days of the week. I was helping my sister, Ele whose car was in the shop. Knowing it was pretty cold…3 degrees when I went to start the car on Monday morning, I went out early. I wanted to give it plenty of time to warm up before I had to get it moving. I was bored sitting there so what better to do than to take a cold weather selfie. This was me, sitting in the car, waiting. I had quite a few layers on but it was still cold. The car heater took it’s time to start warming up, too. I did survive. As I’m writing this, the temperature on my phone reads 32 degrees. That sounds a lot better. That sounds like a heat wave to me!! Be sure to check out the other photographers joining in for Saturday Snapshot over at West Metro Mommy Reads. Enjoy the warm weather!! It does look so cold. We’ve been watching your weather on the news, and heard about it from friends. It’s hard to imagine from an Australian summer. 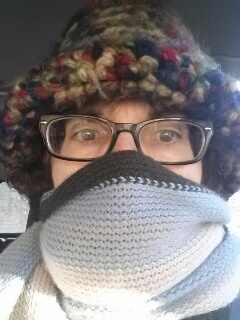 I hope this cold snap passes soon. I love your selfie! And I think your hat is awesome! All that nubby yarn, hope it is as warm as it looks. It is warming up a bit in Wyoming too this week, but it probably will not last! I feel terrible complaining about the 20s…lol. I don’t like extreme heats, like we have here in the summers, but I’m grateful not to have extreme cold. Keep those layers going! Thanks for visiting my blog. You know it has been cold when 32 sounds warm! Ha ha! You are SO right, Melinda!! Have a great day! Lucky you,Paulita! It’s warmed up a bit here, and I’m keeping my fingers crossed it stays that way! Hey at least you’re bundled up! We’re in Michigan and it was definetly warm up the car ahead of time all week last week. It’s warming up a little now (30’s), which feels pretty good! Have a great weekend. I don’t envy you, Greg. I know you guys get much colder temps than we do here in NJ. Last few days have been in the 40/50 range. I’ll take that! Thanks for stopping by.! It’s hard to imagine being so cold – makes you wonder how the early pioneer families survived! You’re so right, Brona. I need to come to visit you in Australia!! Have a great day! Love your selfie! I am terrible at selfies! Thanks, Gautami! I just thought it would be fun, besides I was bored sitting in the car while it warmed up. Have a great day! All bundled up. I love it. Boy I needed it that day! !